One of the simplest and most effective ways of tweaking sensor input on cars systems is to use a pot to alter the output. And that applies whether the systems involve engine management, electronically-controlled EGR, torque split control in an active all-wheel drive system, or even stability control. However, most people don’t have any idea of how this works – they think of a pot only as a variable resistor… which it most certainly is not. It’s actually all very straightforward to get your head around the differences – and understanding what is going on also reveals that this sort of modification is much more sophisticated than many people think. While these devices are called ‘pots’, they’re a component that can actually be used in two quite different ways in circuits. But first, what actually are they? You probably best know a pot as the knob that you turn on an older radio or amplifier to make the sound louder or softer. But what’s behind the knob? A pot of this type consists of a semi-circular resistor track and a moveable wiper that slides along the track as the knob is turned. In the circuit diagrams that we’re going to use here, the resistance track is shown by the rectangle and the moveable wiper by the arrow. 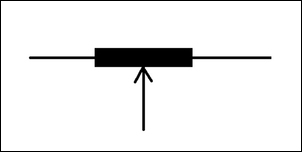 As you can see in this diagram of a pot, there are three connections – one at each end of the resistor track, and another for the moveable wiper. On nearly all circular pots, the terminals are arranged like this, with the two outer terminals corresponding to the two ends of the resistance track, and the centre terminal corresponding to the wiper. 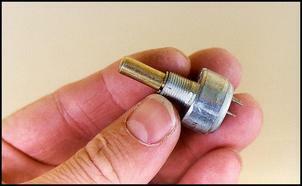 A pot can be used as a variable resistor (in old publications called a “rheostat”). Note how this circuit shows it needs only two of the three wires connected. As the wiper is moved to the left, the resistance in the circuit rises and so the light will get dimmer. Note also how the variable resistor is wired in series with the load (the light). 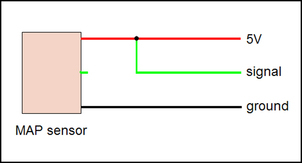 The primary job of the variable resistor in this circuit is to vary current. A conventional dashboard dimmer is a variable resistor of this type. 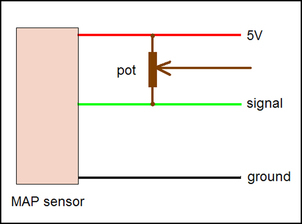 A pot can also be used as a true potentiometer, that is, a voltage divider. Note how now all three connections are being used. As the wiper is moved upwards, the voltmeter will read closer to 12V, until with the wiper at the very top it will read 12V. As the wiper is moved down the track it will read a proportion of the 12V – half way down, it will read half of 12V (i.e. 6V). Two-thirds of the way down it will read 4 volts. At the very bottom it will read 0V. 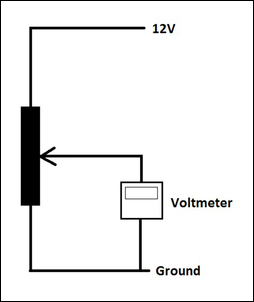 Note how the pot is connected with the resistance track in parallel with the load (the voltmeter). The primary job of the variable resistor in this circuit is to vary voltage. 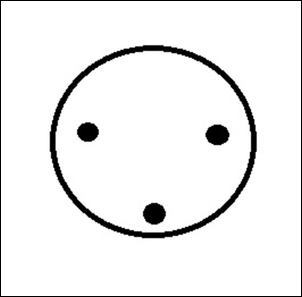 A volume control on an old amplifier is a voltage divider of this type. In tweaking car systems using pots, it is vital to use the component in the correct way. 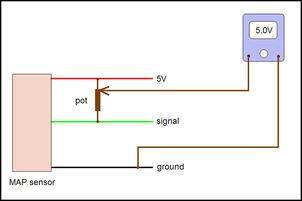 Let’s take a look at using a pot to alter the input signal an ECU sees. Many voltage-outputting sensors have three connections. 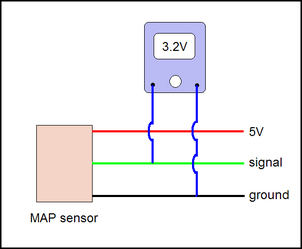 Here is a diagram of a MAP sensor. One wire (here it is red) is a regulated 5V supply from the ECU. (Regulated means it is held at a fixed voltage, irrespective of battery voltage.) There is also a ground wire (black) that somewhere is connected to the car’s body – probably back at the ECU. Finally, there is another wire (green here) that is the signal output. If you connect a multimeter to the signal and ground wires, and then drive the car, you’ll be able to see on the multimeter how the signal varies in different driving conditions. For example, you might find that the lowest reading is 0.8V and the highest is 4.6V. You might also be able to see that the highest occurs at full throttle and the lowest occurs on the engine over-run. The ECU uses this signal to detect what is occurring – in this case, what the intake manifold pressure is at any given moment. OK, let’s go back to the MAP sensor. (Remember that the MAP sensor is connected to the ECU, although I haven’t bothered showing all the wiring.) The highest that the MAP sensor output can go is 5V, and the lowest it can go is 0V. But this sort of sensor is rarely holding a steady signal output – it’s up and down as the driver moves their foot. So if we wanted the ECU to see a higher voltage coming from this sensor, we can’t just cut off the sensor wire and connect it to 5V, as shown here. Sure, that would mean that the signal voltage the ECU sees from the sensor is higher – but it’s also now fixed, not varying with engine conditions. For the same reason, we can’t just connect the signal wire to ground. If we want to raise the sensor output voltage (so for example, the ECU thinks that manifold pressure is higher than it really is), we need to add a proportional voltage to the signal. So, how do we do that? If you said “with a pot”, you’re right. Let’s put a multimeter in the circuit, measuring the voltage on the wiper of the pot. (Note how the other probe of the multimeter still goes to ground - voltages are almost always measured with respect to ground.) The pot has been set so that its wiper is at the top – close to the 5V supply. This is the same as connecting the multimeter probe to the 5V supply, so the meter reads 5.0V. Now we’ve moved the pot wiper so that it’s down the bottom – effectively connecting it straight to the signal wire. Since the signal is at 1.6V, that’s also what the meter reads. But now we’ve moved the wiper up just a bit. The multimeter is reading a combined signal – the signal voltage plus the proportional voltage we’ve added to it. So the meter reads 3.3V – we’ve added 1.7 volts (107 per cent) to the signal. There’s just one step left. If we connect the ECU signal wire to the pot wiper rather than to the MAP sensor, we can dial-in any addition to the sensor signal that we want. The signal will still rise and fall as it did before, but with an additional proportional voltage on top. 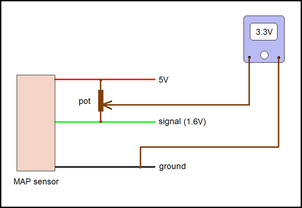 By changing the position of the pot, we can change how much voltage we add to the signal. 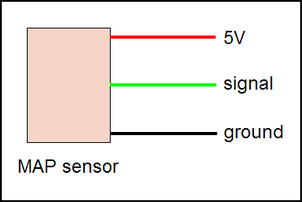 If we want to subtract a voltage, we just connect the pot between ground and the sensor signal, like this. 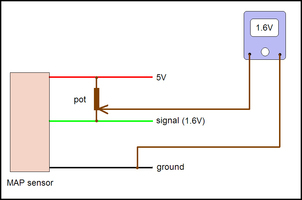 This approach is radically different from using a pot as a variable resistor in the signal line going to the ECU. You could use a series variable resistor in this way, but the affect it would have on the signal would be very hard to tell – it depends on what is called the input impedance of the ECU. In short, a series variable resistor is very likely to achieve absolutely zero change – and even if it did cause a change, it can only reduce the signal… not optionally increase it as you can achieve with a potentiometer. The only exception to this is where the sensor itself is a variable resistor - like a coolant or intake air temp sensor. In that case, the ECU is looking for a variable resistance, so adding a series or parallel resistor is quite effective in tweaking the signal the ECU sees. 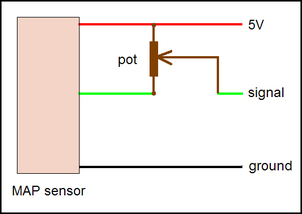 But there’s another really important reason to use a pot as a potentiometer and not as a variable resistor. It when you want to reduce the swings that the voltage output of a sensor makes around a mid-point. This shows a circuit I developed to modify the electric power steering weight in a Toyota Prius. The outcome was achieved for less than $5 by using two pots. In this car, the torque sensor varied in its output away from 2.5 volts with increasing steering torque - greater than 2.5 volts when the steering was turned one way, less than 2.5 volts when the steering was turned the other. The job was to reduce this swing away from 2.5V, so the power steer ECU thought less steering effort was occurring and so provided less steering assistance. Pot 1 is used to simply provide a 2.5V reference signal - see how the wiper is half way between Earth and the regulated 5V, so it will provide (half of 5 =) 2.5V on its wiper terminal. 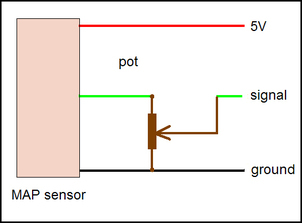 Pot 2 allows the signal seen by the ECU to be set at anywhere from standard (pot at bottom of travel, so connected straight to sensor), to a fixed 2.5V (the voltage provided by the other pot). So by adjusting Pot 2, the signal could be set so that it never swung from 2.5V, through to being standard in swing - or any proportion in between. Therefore, by adjusting Pot 2, the amount of electric steering assistance could be set to whatever you wanted. If you hear people talking about pots as if they’re just variable resistors and not variable voltage dividers, or if you hear people sneering at using pots to tweak sensor outputs, it’s quite likely they’re confused as to what the components are and how they can be used. Over more than 20 years I have used pots (as pots and not variable resistors!) to alter power steering weight, to alter the amount of regen braking occurring in a hybrid, to change the amount of electronically-controlled EGR occurring, to change the output of a load sensor to run bigger injectors, and (had I been aware of the technique at the time) I could also have used it to alter the four wheel drive torque split in a Skyline GT-R.
For just a couple of bucks for some simple electronic components, it’s quite amazing what you can achieve….